Could lava tell history and predict the future? Scientists on drillships are studying colossal slabs of volcanic lava hidden under the sea that shaped its climate, helped determine its life-forms and recorded Earth’s violent past. They think their research can help explain what is happening to our warming world. The extent of some of these buried lava flows is mind-boggling. Fragments left by a series of eruptions 200 million years ago in what now is the Atlantic Ocean stretch across four continents, from New England to France and from the Amazon to West Africa. Along with somewhat smaller — but still enormous — volcanic eruptions on land, these belches from the planet’s fiery interior contributed to a series of mass extinctions of most of the organisms that were alive at the time. Although the extinctions were devastating to life, scientists think they opened the way for new, more advanced creatures to evolve, including humans. Mass extinctions have “radically changed the types of life on Earth, because rapid evolution after each disaster led to the older forms becoming replaced by newer forms,” said Gregory McHone, a geologist at Wesleyan University in Middletown, Conn. The blasts from the past may have ominous implications for future climate change, some scientists say. “The rapid release of carbon dioxide into the atmosphere, happening today, appears to have happened in the past, too,” said Paul Wignall, an earth scientist at the University of Leeds in England. Lava is a common type of rock that has been melted by temperatures as high as 2,000 degrees Fahrenheit and flows from a volcano or cracks in Earth’s surface. It rises from a 400-mile-thick layer of hot, gooey material, known as magma, that lies between the planet’s crust and its solid core. Most of the oceanic lava sheets are invisible from the surface, but Earth’s continents also bear traces of huge volcanic eruptions, some of them recent. Yellowstone National Park in Wyoming, for instance, contains a 50- by 40-mile crater left by a series of eruptions, averaging about 600,000 years apart. The last explosion came 630,000 years ago, so the park is overdue for another. It produced enough lava, ash and rock to cover New York state 67 feet deep, he said. Although geologists have known for decades about the lava provinces, many questions remain about these extraordinary structures. More continue to be found. A new one was reported in July under a large area of western Australia. Exploration of the lava beds also is turning up new sources of valuable minerals, said Don Schissel, an executive with BHP Billiton, a global mining company with headquarters in Melbourne, Australia. “There is a clear relationship between large igneous provinces and the world’s nickel, copper, platinum ore deposits,” Schissel reported last fall in a collection of research papers on the provinces. Krakatau volcano is still active today. Aug. 27, 1883: On this day Krakatau, a small, uninhabited island in Indonesia, exploded in the most powerful volcanic eruption in recorded history. Volcanic activity began on May 20 and on Aug. 26 stronger, more violent eruptions began. On Aug. 27 four giant explosions occurred, blowing away the northern two-thirds of the island and causing 120-foot tidal waves that killed 36,000 inhabitants of the nearby islands of Java and Sumatra. The explosive eruptions were heard 2,000 miles away in Australia. Ash was propelled to a height of 50 miles. The fine dust from the eruptions drifted around the earth, causing breathtaking sunsets and dropping the world temperature by a degree. Krakatau is still an active volcano today. Scientists study possible link between volcano eruptions and climate. Along with somewhat smaller - but still enormous - volcanic eruptions on dry land, these belches from the planet's fiery interior contributed to a series of mass extinctions of most of the organisms that were then alive. Although the extinctions were devastating to life at the time, scientists think they opened the way for new, more advanced creatures to evolve, including ourselves. Without them, we wouldn't be here. "In many ways, these rapid and giant eruptions seem to replicate the effects of fossil fuel burning, and so have provided natural experiments closely similar to human activity," Wignall said in an e-mail message. "The consequence of rapid warming of oceans and atmospheres appears to be mass extinction." The vast expanses of seafloor lava - technically known as "Large Igneous Provinces" - are "one of Earth's most fascinating features," said John Mahoney, a geologist at the University of Hawaii in Honolulu. "They provide insights into the causes of major environmental and biological changes in the past," he said in an e-mail interview, and "almost certainly played an important role in bringing about these extinctions." "Eventually Yellowstone will erupt again," said Don Hyndman, a geologist at the University of Montana. "When it does, I don't want to be living in Bozeman" - 90 miles away. "The last event blew ash as far as Kansas and Arkansas." It produced enough lava, ash and rock to cover New York state 67 feet deep, he said. According to Hyndman, Yellowstone is sitting on a rising plume of molten rock - like a gigantic lava lamp - from below the Earth's surface. The plume makes the park floor bulge above the surrounding landscape. The heat from below drives hot springs and geysers, such as Old Faithful. The last Yellowstone eruption dwarfed more recent volcanic events, such as Krakatoa in 1883 or Mount St. Helens in 1980. It was greater than a monster blast at Tambora in Indonesia in 1815 that killed about 100,000 people. Tambora's gas and dust circled the Earth, leading to a fabled "year without a summer" in North America, crop failures and food riots in Europe. In another example, a mile-and-a-half-thick layer of lava, known as the Deccan Traps, flowed across a large part of India 65 million years ago. Its toxic emissions probably weakened the dinosaurs before the impact of a huge meteor finished them off, French scientists reported in the Aug. 12 edition of the journal Science. Lava may hold answers to questions about shifting climates. They think their research can help explain what's happening to the warming world today. The extent of some of these buried lava flows is mind-boggling. Fragments left by a series of eruptions 200 million years ago in what's now the Atlantic Ocean stretch across four continents, in places from New England to France and from the Amazon to west Africa. Along with somewhat smaller -- but still enormous -- volcanic eruptions on dry land, these belches from the planet's fiery interior contributed to a series of mass extinctions of most of the organisms that were then alive. Although the extinctions were devastating to life at the time, scientists think they opened the way for new, more advanced creatures to evolve, including humans. Mass extinctions have "radically changed the types of life on Earth because rapid evolution after each disaster led to the older forms becoming replaced by newer forms," said Gregory McHone, a geologist at Wesleyan University in Middletown, Conn.
Lava is a common type of rock that's been melted by temperatures as high as 2,000 degrees and flows out from a volcano or a crack in the Earth's surface. It rises from a 400-mile-thick layer of hot, gooey material, known as magma, that lies between the planet's crust and its solid core. The oceanic lava sheets are mostly invisible from the surface, but continents also bear traces of huge volcanic eruptions. Yellowstone National Park in Wyoming, for instance, contains a 50-by-40-mile crater left by a series of volcanic eruptions, averaging about 600,000 years apart. Volcano eruptions influence greatly the climate. When a volcano erupts, it does more than just create an ash cloud that darkens and cools a region for a few days. Instead, the most dramatic effect is actually high above us, where spewed volcanic material is not quickly washed out by rain. If the volcanic eruption is strong enough it will inject material into the stratosphere, more than 10 miles above the Earth's surface. Here, tiny particles called aerosols form when the volcano's sulfur dioxide combines with water vapor. Despite their size, these aerosols work to alter interactions between the atmosphere and sun, affecting climate patterns. Now, new research funded by NASA and the National Science Foundation, focusing on the eruption of Mount Katmai, Alaska, in June 1912, shows that location is also important, as major volcanic eruptions far north of the equator affect the world's climate much differently than volcanoes in the tropics. The Mount Katmai eruption was the one of the largest in the world during the 20th century. It actually refers to the eruption of Katmai and the larger explosion of Novarupta, just west, that spewed tons of sulfur dioxide gas into the atmosphere. Novarupta also released an incredible amount of molten rock (magma) that drained under Katmai causing its summit to collapse, forming a massive crater (caldera). The ash fall from the eruption covered an area of more than 3,000 square miles to a depth of a foot or more, while its ash cloud, carried by winds high in the atmosphere, spread a haze as far away as Africa. "Studying such events will help us be better prepared for the next major eruption while giving scientists clues on the type of climate shifts and changes to expect," said Luke Oman, a researcher at Rutgers University's Department of Environmental Sciences, New Brunswick, N.J., and lead author of the study that appeared in the July 2005 issue of the Journal of Geophysical Research-Atmospheres. By using one of the most modern General Circulation computer climate Models (GCMs) at NASA's Goddard Institute for Space Studies (GISS), New York, N.Y., the researchers studied the Mount Katmai volcanic eruption. They made a computer simulation of Katmai's eruption and an eruption three times as large to study their climate impacts. Unlike earlier studies on volcanic eruptions in the tropics, this research did not show a change in an important climate pattern called the "Arctic Oscillation" (AO) following the Mount Katmai eruption. AO is a climate pattern defined by winds circulating counterclockwise around the Arctic at about 55 degrees north latitude (about even with Moscow). The air can spin more slowly and spill cold air down toward the equator into the mid-latitudes, or it can spin faster and keep the cold up north. "Large tropical volcanic eruptions tend to spread aerosols around the globe, but with high-latitude eruptions like Katmai, they remain north of 30°N latitude, where they are heated less efficiently by outgoing, or longwave radiation," said Oman. "As a result, the lower stratosphere does not warm enough to influence the AO." Eruptions in the tropics, like Mount Pinatubo in 1991, create aerosols that block heat from the sun in the lower atmosphere, or troposphere, cooling temperatures in the subtropics. In turn, the reduced north to south temperature gradient results in a "positive" phase of the AO, with generally warmer winters over the Northern Hemisphere. "In our research, although the Mount Katmai eruption was found to have some role in the winter climate, including distinct cooling in southern Asia, the most significant climate effect was during the summer when strong cooling over the Northern Hemisphere landmasses caused a decrease in the Asian monsoon circulation," said Oman. Normally, northern India experiences large amounts of cloudiness and rain due to the summer monsoon, the seasonal shift in winds that develops out of the temperature contrast between the Indian Ocean and Asia. But, the eruption worked to lessen this gradient, weakening the monsoon, bringing reduced cloudiness, warmer temperatures and less precipitation across northern India west into the Persian Gulf. "This study not only offers further evidence that the location and intensity of an eruption largely determine the Earth's overall climatic response, it also helps us see how well our computer models perform," said co-author Gavin Schmidt of NASA GISS. To verify our knowledge about the effects of volcanoes, researchers often investigate historic intense eruptions that brought major climate swings, like the Laki, Iceland eruption of 1783 that dimmed and reddened the sun while resulting in a very warm summer in Europe and one of the coldest winters on record for the Northeast United States and Europe in 1783-1784. Using a variety of techniques, including the measurement of acid fallout over polar areas from ice cores and analyzing annual growth rings in trees, researchers can confirm first hand the impact of such ancient eruptions. Hundreds of earthquakes have been rocking three uninhabited islands in the Northern Marianas as the nearby Anatahan volcano erupts. The U-S Geological Survey and the C-N-M-I Emergency Management Office say 570 earthquakes were recorded on an island 95 miles north of Saipan as of Saturday. The agencies say the earthquakes are occurring at a rate of 30 per hour. The volcano was also recorded spewing ash. Air Force Weather Agency satellite imagery indicated ash had risen 20-thousand feet and had spread out 70 nautical miles south of Anatahan. Geologists have found no evidence of ancient explosive eruptions by the volcano. The first historical eruption began in May 2003. That prompted the island's 20 or so residents to evacuate to Saipan. The island has been uninhabited since. In April, the force of an Anatahan eruption spewed ash as high as 50,000 feet and delivered ash as far as Palau and the Philippines. Volcanic eruptions impact depend on latitude! Volcanic eruptions at northern latitudes have a different impact on the climate than eruptions in the tropics, a new study shows. 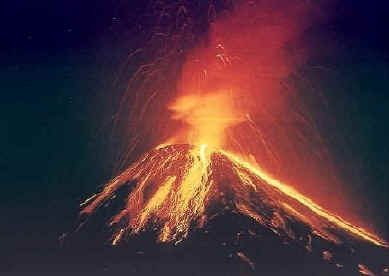 Volcanoes can pump ash and chemicals 10 miles (16 kilometers) or higher into the air in major eruptions. Winds push the stuff around the planet. Up high, sulfur dioxide from a volcano mixes with water vapor and forms small particles called aerosols, which block sunlight and affect climate. Using data from real eruptions and climate projections from advanced computer models, researchers looked at how differently the material is spread in an Alaskan eruption versus one in the Philippines. Turns out tropical eruptions result in a wider distribution of particles, while material from eruptions in the far north tends to stay up there. The result can affect your weather for months. Northern eruptions are carried east by a band of wind around the Arctic. The wind circles the planet at about the latitude of Moscow. In 1912, the Mount Katmai region in Alaska generated one of the largest eruptions of the 20th Century. (The main source was actually the nearby volcano Novarupta, but itÕs long been called the Katmai eruption). Ash fell a foot deep across more than 3,000 square miles, and the higher cloud was carried as far away Africa. The Katmai eruption was compared to the 1991 explosion of Mount Pinatubo in the Philippines. That event caused the entire planet to cool by about 1 degree. Tropical eruptions tend to create aerosols that block heat from the sun in the lower atmosphere, cooling temperatures in the subtropics. But in turn, this creates a reduced north-to-south temperature gradient that generally causes warmer winters over the Northern Hemisphere. "Although the Mount Katmai eruption was found to have some role in the winter climate, including distinct cooling in southern Asia, the most significant climate effect was during the summer when strong cooling over the Northern Hemisphere landmasses caused a decrease in the Asian monsoon circulation," said Luke Oman, a researcher at Rutgers University. "Large tropical volcanic eruptions tend to spread aerosols around the globe, but with high-latitude eruptions like Katmai, they remain north of 30¡N latitude." "This study not only offers further evidence that the location and intensity of an eruption largely determine the Earth's overall climatic response, it also helps us see how well our computer models perform," said co-author Gavin Schmidt of NASA. Are volcacoes responsible of the end of dinosaurs? Volcanic eruptions may have triggered the demise of the dinosaurs. Many scientists believed that an asteroid caused the mass extinction 65 million years ago. However, a new study points to a more complex event that began with a series of eruptions which took place in what is now north-western India. The Deccan Traps in Maharashtra state are flows of lava resulting from huge outpourings of molten rock and ash. A mile deep, they cover about 200,000 square miles. Vulcanologists have long thought the eruption, dated to about 65 million years ago, could have caused the extinction. However, the Deccan Traps resulted from a series of eruptions that occurred over perhaps a million years. This would have given the global climate plenty of time to adjust. But the study shows a major part of the eruption occurred over a short period. Scientists from the Institut de Physique du Globe de Pariscalculated that at least 2,000ft of lava was deposited in 30,000 years, which could have greatly altered global climate. They have also shown that the Traps were erupting when the asteroid crashed into what is now Mexico. This was a spectacular and almost unprecedented double whammy for Earth. Mike Widdowson, a vulcanologist, said it seems the end of the dinosaurs may have begun with climate change brought about by the eruptions and ended with the asteroid. "The eruptions pre-conditioned the global environment toward a catastrophic tipping point before the impact occurred. The asteroid was the coup de grâce," he said. Are volcanoes responsible for the extinction of dinosaurs? In the ongoing debate about whether a giant meteor or spewing volcanoes killed the dinosaurs, notch one up for the volcanoes. At a scientific conference on Wednesday, a French researcher presented a study of Indian lava fields that suggested ancient volcanic activity was intense enough to have caused the climate changes believed to lie behind the extinction of the giant lizards. “We can see that due to the surface degassing of the lava flow we have a potential impact on climate,” said Anne-Lise Chenet of the Institut de Physique du Globe de Paris. Some scientists theorize that dinosaurs died out about 65 million years ago — along with more than 70 per cent of all species on Earth — as a result of climate change caused by the impact of a massive asteroid crashing into our planet. That impact would have sent trillions of tonnes of dust into the air and sparked huge fires. That combination of dust and soot — some estimates suggest 25 per cent of earth's vegetation burned — would have lowered temperatures and acidified rainfall around the globe, destroying dinosaur habitat. An undersea crater off Mexico's Yucatan coast is thought to be the impact site. But other scientists believe earth's climate changed as a result of gases belched into the air from an upswing in volcanic activity. Eruptions release both carbon dioxide, a major greenhouse gas, and sulphur dioxide, a source of acid rain. They also load the atmosphere with fine dust and soot. Pro-volcano researchers have long pointed to the Deccan Trap in India, a vast area of volcanic rock thought to have originally contained up to three million cubic kilometres of ancient lava. That many eruptions could have released enough gas to be climate-altering — if they happened in rapid enough succession. According to Dr. Chenet, that's exactly what happened. “We found that the volcanism duration is certainly shorter than it was estimated before,” she said. Dr. Chenet and her team dated the ancient lava flows by taking advantage of how the earth's magnetic field has shifted over time. Lava contains magnetic minerals that align themselves with the earth's magnetic field before the lava cools. By comparing that alignment with what is known about how the magnetic field has shifted, scientists can date the flow. Using that method, Dr. Chenet estimates that a layer of lava 600 metres thick may have piled up in as little as 30,000 years, and that the entire volcanic episode lasted about a million years. “Volcanism might be a key player in mass extinctions,” Dr. Chenet said. As well, right in the middle of the lava, Dr. Chenet also found a layer of iridium thought to have come from the Yucatan asteroid, which would prove the volcanoes predated it. Dr. Chenet's next task will be to calculate the amount of gas and sulphur compounds that would have been emitted during the period of the eruptions. Scientists will then attempt to estimate the changes those gases might have caused. Dr. Chenet points out that over the last 300 million years, all mass extinctions have coincided with major volcanic activity. The extinction that killed off the dinosaurs, known as the Cretaceous-Tertiary mass extinction, is the largest the earth has ever known. All land animals, everywhere on earth, that were larger than 25 kilograms were killed off. McDonald Island volcano displays some activity! A volcano on Australia's remote, tiny and uninhabited McDonald Island in the Southern Ocean is erupting for the first time since 2001, the government announced on Wednesday.Satellite images detected the volcanic activity on the World Heritage listed island, which is 4 100km south-west of Australia, said Environment Minister Ian Campbell.The volcano lay dormant for 75 000 years before erupting for the first time in 1992, he said.There have been several eruptions since then, the last in 2001 when satellite images showed the size of the island had doubled. "The McDonald Island volcano is unusual because unlike most oceanic volcanoes, it sits on a submarine plateau, which means its eruptions are not as wild and fiery as some - instead producing a slow-moving mass of lava that seeps and spreads," Campbell said. "Despite the slow-moving nature of the lava, eruptions over the past 13 years have caused startling changes to the island's geography, obliterating some landmarks and creating new ones." While people tend to think of volcanoes as destructive, this remarkable natural phenomenon is also productive, creating new land that will make the island more attractive to seabirds, particularly the king penguin. "The island is within the Heard Island and McDonald Islands Marine Reserve, one of the world's biggest.Campbell said "almost nothing" is known of McDonald Island "because its uninviting terrain and surrounding hazardous seas make it virtually impossible to get ashore." Balloon trip may face more than hot air! Hot air could take on a whole new meaning if an adventurous balloonist brushes with the volcanic variety in his attempt to fly over Mt Ruapehu tomorrow. Rick Walczak has flown all around the world, and makes annual flights in Japan and the United States. Tomorrow, weather permitting, he’ll have a practice run with his first active volcano. His encounter with Ruapehu is a warm-up for a future attempt on the much more active White Island, in the Bay of Plenty. Ruapehu may have some steam eruptions or sulphur emissions, as well as 15-knot winds, to help prepare the intrepid balloonist. He’s planning to go high, and try to avoid them. He’s also wary of the broken and disturbed airstream he’s likely to find on the far side of the mountain. Mr Walczak plans to take off from SH4 near National Park around 6.30am, taking advantage of the calm winds of early morning. He has been checking the weather carefully and expects a westerly wind. Wind from another direction could enable him to traverse Ngauruhoe and Tongariro as well as Ruapehu, and he expects to get spectacular photos. He wants to be on the ground near SH1 and Waiouru by about 10am, and well grounded by late afternoon, when a front is expected. He’s planning to take his son Chris, 28, along as his Ruapehu co-pilot. He said it took a crew of about 15 to prepare such a flight. Tomorrow’s venture includes two helicopters, one to film and the other to hover nearby in case it is needed for a rescue. If the weather is rotten, Mr Walczak said, he would return to his Carterton home and possibly try for the Ruapehu flight again later, but not for at least two weeks. Flights took a huge amount of organisation and New Zealand’s safety rules made that harder and harder. Being airborne also cost thousands of dollars, and he was grateful for the Eggs Incorporated sponsorship of his “An Egg a Day is Now OK” balloon. His previous flights in Godzone included one over Mt Taranaki and an attempt on Mt Cook that was foiled by bad weather. The White Island stunt was scheduled for late summer. Mr Walczak said he had been an adventure pilot, mainly of balloons and Microlights, for 28 years. He took an early retirement from his job as an FX (foreign exchange) dealer, though a recent loss meant he might have to go back to work. Australian volcano blows its top! A volcano is erupting on Australia's most remote territory, McDonald Island, in the sub-Antarctic. The volcanic activity is changing the shape of the island and ultimately changing the environmental make-up of its cold and windswept surface. Environment Minister Ian Campbell said satellite images had detected the volcanic activity on the rarely visited island, 4,100km southwest of Western Australia. McDonald is better known for its surrounding waters which are home to the Patagonian toothfish, heavily poached by ships transgressing Australian waters. Its steep shores, surrounded by treacherous seas, were last visited by humans in 2002. 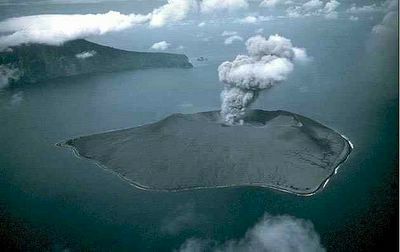 Senator Campbell said the McDonald Island volcano had been dormant for 75,000 years before erupting for the first time in 1992. He said there had been several eruptions since - most recently in 2001 - and the island's size had doubled in that time from 1.13sq km to 2.45sq km. "The McDonald Island volcano is also unusual because, unlike most oceanic volcanoes, it sits on a shallow submarine plateau," Senator Campbell said. "(This) means its eruptions are not as wild and fiery as some, instead producing a slow-moving mass of lava that seeps and spreads. "Despite the slow-moving nature of the lava, eruptions over the past 13 years have caused startling changes to the island's geography, obliterating some landmarks and creating new ones." Senator Campbell said the island was previously inhabited by macaroni penguins. "Now, because you've created this pumice that comes out of the volcano, you've created this very big beach area with pumice, which is one of the desirable habitats for rookeries for the king penguin. "King penguins, which hadn't been seen on this island for ever, I think, or a long time, have actually started colonising the island. "You're getting this increase in biodiversity occurring. The island is within the Heard Island and McDonald Islands (HIMI) Marine Reserve, one of the world's biggest marine reserves. It is just 44km from Australia's only other active volcano on Heard Island, where there has not been any activity for some time. Is strong earthquake a sign of a future eruption? A strong earthquake shook Nicaragua and northern Costa Rica before dawn Wednesday, but no injuries or damages were reported. The magnitude 6.3 earthquake was centered 75 miles southeast of Managua, the Nicaraguan capital, according to the U.S. Geological Survey's National Earthquake Information Center. It hit at 5:03 a.m. at a depth of 6.2 miles. Nicaraguan authorities also reported a second earthquake of magnitude 4.5 about an hour and a half later in nearly the same location. Red Cross and government civil defense officials had no reports of injuries or destruction in Nicaragua. The earthquake jarred awake residents on the island of Ometepe on Lake Nicaragua, but many people slept through it in Managua. "There were no victims or material damages," said Felipe Morales, mayor of Altagracia, an Ometepe Island village on the eastern slopes of Concepcion volcano. "But nevertheless we suspended classes, and we are still on alert." Islanders were still jittery after eruptions last week at the 5,282-foot tall volcano that rained ash 10 miles away. The temblors were felt as far away as Bluefields on the Caribbean coast 170 miles east of Managua. Nicaragua's disaster prevention agency on Wednesday warned of an impending eruption of the country's Concepcion Volcano. A recent series of seisms in Ometepe Island in Nicaragua Lake could be a sign that Concepcion Volcano "has awaken" pending an eruption, according to the Disaster Prevention and Management System (SINAPRED). The condition of Concepcion warrants "special attention" because the quakes are "a symptom of the start of an eruption process," said SINAPRED Executive Director Cristobal Sequeir. Claudio Gutierrez, of Nicaraguan Territorial Studies Institute (INETER), also warned that some 10 earthquakes measuring above 4.0on the Richter scale and 20 minor ones "could mean there is an eruption coming." The official said "never before have we had so strong earthquakes close to the volcano." INETER recorded the first of the tremors at 4:27 local time (0927 GMT), measuring 3.4 on the Richter scale. The strongest jolt measuring 5.6 on the Richter scale occurred at 6:03 local time (1103 GMT), with its epicenter located 100 km southeast of Managua. The Concepcion Volcano unleashed several explosions last week and expelled ashes spreading over 24 km to its west. The 1,620-meter volcano, 120 km southeast of Managua, is one of the most active in Nicaragua and has had permanent, low-intensity activity with small seismic tremors, constantly releasing gases and creating small explosions in the crater. A total of 17 eruptions have been recorded since 1883. Moderate eruptions from the volcano in the 1970s and 1980s caused lava flows. The latest eruption took place in 1999. A giant cloud of dark ash billows from the roaring volcano as boulder-sized lava fragments shoot skywards before splashing into the sea like shells in a naval battle.This is Tavurvur, which in September 1994 erupted along with nearby Vulcan to destroy much of the port town of Rabaul on the Papua New Guinea island of New Britain. The volcano continues to put on an awesome display and is a spectacular drawcard for adventurous tourists as it roars like a jet while spewing out clouds of ash. The ash regularly rains down on the nearby residents of Rabaul who show true grit as they get on with their lives and try to rebuild the ravaged town.Evacuations during the 1994 eruptions saved most of the population but not the property - only three people died under the ash deluge.Rabaul, once renowned as a pearl of the Pacific, is a grit-encrusted shadow of its former self, part of it a desolate wasteland of banked-up grey ash, ruins and scrub. When the ash is falling, there is a whiff of sulphur in the air and grit gets into eyes, ears and hair.Roofs, roads, parks, gardens and vehicles end up covered in a sand-like coating of fine ash, which needs to be constantly cleared away.Residents sometimes wear masks or bandanas when outside, while swimming pools in the town have long been made redundant by the falling ash which also makes metal rust faster when the sulphur and rainwater mix. But many of Rabaul's people, including longtime Australian and Chinese residents, trust the ash falls will stop one day and are determined to revitalise "volcano town".It's not the first time Rabaul has risen from the ashes - it was rebuilt after Allied bombing flattened it during the Japanese occupation in World War II and was rebuilt after the 1937 eruption of Vulcan that killed around 500 people.By the hot springs across the water from Tavurvur as it pours forth plumes of ash, 80-year-old Ken Kolias Towok of nearby Matupit village, recalls the 1937 eruption. His village escaped destruction but as Vulcan emerged from the sea, great waves of water swept onto the coastal settlements and took people without warning.Matupit also escaped destruction in 1994 but the ensuing ash falls destroyed crops, contaminated water supplies and made life tough for villagers, Towok says.The ash clouds blocked out the sky and people had to use torches during the day, he recalls.Food gardening near the volcano has been curbed by the ash falls, Towok says, and many Matupit people have moved 100km away to a government-provided settlement at Sikut where they can grow crops. Towok says volcanoes are good when they create new land and his people believe Tavurvur will keep on erupting ash for a while yet.Last year the volcano did stop emitting ash for 11 months before starting again in January this year.While it broils away, an annual seasonal wind change gives Rabaul residents a few months reprieve each year as the ash is blown out to sea or across the harbour where it can stop flights into Tokua Airport. The latest report from the Rabaul Volcanological Observatory outlines an increase in activity with ash plumes up to 2,000m high and the ejection of lava fragments.Measurement of earthquake activity suggests eruptive activity will continue indefinitely, the observatory says.It is not warning of any life-threatening boost in activity at this stage and many see the continuous venting of the volcano as averting a dangerous build-up of pressure. Englishman Nick Lyons of Rabaul Metal Industries says the ash falls impose a huge burden on maintenance staff in local industries and businesses. "We are just forever cleaning up. It's not destroying anything, it's just making life very unpleasant," he said. "The people who really suffer are the people in the villages who don't have permanent materials for their houses. "Lyons notes that PNG government policy is that nothing should be done to encourage Rabaul as a residential area. "That's probably wise given that every 50 years or so there might be a catastrophic event, it's hard to defend spending lots of money. "But the area has a high population and a large number of people will continue to live in Rabaul and require adequate services such as schools and clinics, Lyons says. "The evacuated are coming back and trying to reestablish themselves. I guess the government is understandably cautious about providing services but they have to address the reality that lots of people continue to live around here. "For the dozens of foreign tourists who came to Rabaul for this month's annual festival celebrating PNG's traditional mask cultures, the volcano was a major attraction and they put up with the ash showers as part of the show.East New Britain Chamber of Commerce President Bruce Alexander, an Australian, wants to see four such annual events to attract more tourists and hopes a six-volcano adventure race for athletes will kick off next year. Rabaul has much to offer tourists with its volcanoes, scuba diving and colonial and war history, but business visitors prefer to stay across the harbour at Kokopo, says Alexander, who runs the Hamamas Hotel with his wife Suzie.The volcano is a good excuse to slow up planning but the authorities need to ensure a proper level of services in Rabaul, including health clinics, schools, a new market, police station and fire truck, he says. Australian Tim Wilson has been in Rabaul since 1968 and manages the Travel Lodge where he employs three people just to clean up the ash. He says it's disappointing when politicians push everything to Kokopo where most government services now operate. "There's a priority list. Kokopo always ends up on top. It's a services thing, we feel we are very second class citizens. "But private businesses have been leading the government back to Rabaul, Wilson says. "This is where we chose to be and now we are here we just have to make the best of it. In some ways it's character building." Is Yellowstone a super volcano? • Quake updates: The Yellowstone Volcano Observatory Web site has maps, photos and monthly updates about seismic activity. The observatory is a partnership of Yellowstone National Park, the U.S. Geological Survey and the University of Utah. • Geological background: Windows Into the Earth ($40; Oxford University Press), written by Robert B. Smith and released in 2000, provides a thorough explanation of Yellowstone geology and a detailed driving tour. • Planning a trip: basic Yellowstone information supplied by the National Park Service. • Lodging: Xanterra Parks & Resorts is the primary in-park concessioner at Yellowstone. No booking fee is charged. Touring the sitesA tour of the cataclysm can be made by driving the park's 86-mile Lower Loop Road, which connects Old Faithful Geyser, Yellowstone Lake, the Grand Canyon of Yellowstone and other important sites. The loop is entirely within the caldera. It can be driven in a day, although locals claim a lifetime is not enough. Mud VolcanoDown the road 10 miles is a volcanic kid-pleaser: the roiling, stinky cauldrons of Mud Volcano. One of the pools is more acidic than a car's battery. A boardwalk leads up the hill to lakes of steaming mud that came to life not long ago in the midst of living forest. FUN: With comical eruptions of boiling clay, mudpots mimic the volcanic action that created them.Some of the trees, bleached and gaunt, stand hip-deep in hot bubbling mud. The turbulence mimics the eruption of lava. The air reeks of hydrogen sulfide, which makes for family jokes all the way to the next stop, Le Hardy Rapids, several miles south. HEAT: Colors radiating from the center of Grand Prismatic Hot Spring are ribbons of multihued heat-loving algae.Besides powering the geysers and bulging out like so much magmatic cellulite, the hotspot also keeps the place rocking. Earthquakes occur frequently, sometimes hundreds in a day. Most are very small, detectible only by instruments. One very big one -- magnitude 7.5 -- occurred in 1959. It triggered a landslide at Hebgen Lake west of the park. A campground was buried, and 28 people died. Is last December's catastrophe the precursor of super volcanoes? Mexico's Popocatepetl Volcano staged two early morning eruptions Friday, sending ashes raining down on parts of southern Mexico City. The moderate eruptions sent a column of hot ash 2.5 kilometers into the air and spat red-hot rocks up to a kilometer from the volcano, the National Disaster Prevention Center reported. The activity at the 5,450-meter volcano, 65 kilometers southeast of the Mexican capital, posed no danger to nearby towns. Mexico City authorities told residents to avoid breathing in the ashes as they clean up. Known as Popo, the volcano has been intermittently erupting since December 1994.